Chances are, many of you know the rest of this popular lullaby. We used to sing it a lot around here, especially when Little M was a newborn and had trouble falling asleep. As much as I love this calming tune, there are definitely times when I think to myself, Enough! I can’t possibly sing this again! 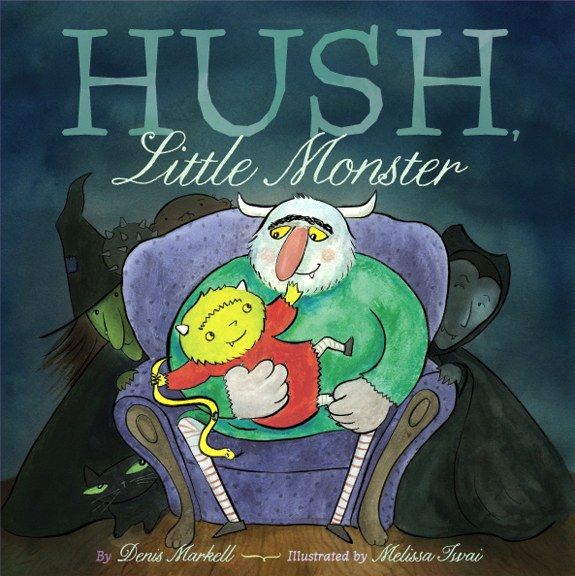 That is, until I came across the wonderful new book, “Hush, Little Monster,” from Brooklyn-based husband and wife team Denis Markell and Melissa Iwai. Hush, Little Monster, don’t you howl, Daddy’s gonna give you a screeching owl. 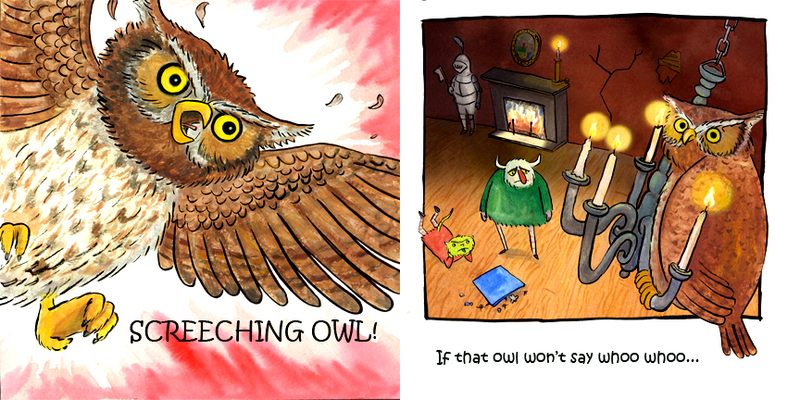 If that owl won’t say ‘whoo whoo’, Granny Ghost will bring you a big, bad boo! Little M and I have read this book before bed every single night since we first received it. He loves the pictures of the spooky (but not scary) creatures and I love the clever new version of “Hush, little baby.” We are also planning to whip up a batch of these monster cookies, which were inspired by the cookies in the book! You can find the recipe on Melissa’s incredible blog, The Hungry Artist. It is also helping to get us into the Halloween spirit, but I am pretty sure we will be reading this well past October 31st! Denis and Melissa have generously shared some of the gorgeous illustrations from their book with Crayons and Croissants readers. They also took the time to chat with me about the inspiration behind Hush, Little Monster, what it was like to work together as a family (with their son Jamie) on this project, some of their favorite recipes and how they spend their ideal day in Brooklyn. 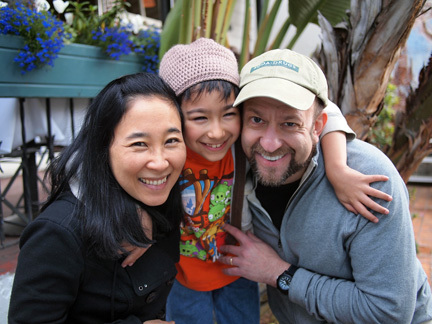 C and C: My son and I love “Hush, Little Monster,” what inspired you to create this book? DM: Like you, I had sung “Hush Little Baby” (which was in heavy rotation with other lullabies) literally for YEARS. I had gotten to the point where my mind was on autopilot while I was singing it for the sixth time one night, and was pondering an idea for a ‘seasonal’ book (Melissa’s holiday books, such as Chanukah Lights Everywhere seem to sell well every year) and the thought of doing a Halloween book popped into my head and so…Hush, Little Monster. As any good author would, I immediately ran to Amazon to see if someone had already thought of it, and thankfully I seemed to be the first. C and C: Have you worked together on other books before? What was it like to work together as a family? DM: We have done one book that’s been published, The Great Stroller Adventure (Scholastic) and have several others out in different stages of development right now. It is a pleasure to work with Melissa, who is able to give constructive criticism and remind me that they are called PICTURE BOOKS for a reason and to let the images tell the story as well as the text. We collaborate on every step, with my discussing concepts for a story early on, and Melissa giving suggestions. Then typically I give her a draft and she goes off to Starbucks (there are limits to both working at home!) and does her preliminary sketches. For the most part, Jamie is mostly supportive and doesn’t offer too much in the way of criticism. Yet. MI: I love working with Denis. It’s really the only time I have ever worked with an author on a project! The norm is for the illustrator to only work with the editor or art director. The author usually has no input whatsoever and often has no choice or say in the matter of who will do the illustrations. Denis and I have a really good relationship, so the work part, I think is just an extension of that. Of course, Jamie has an opinion or everything these days (he’s eight), when we were creating this book, I don’t think he was around much during the process, and he was younger and I don’t think he was paying much attention. But on the projects we’re working on now, he has a great many suggestions! I think it’s also because he’s a budding writer himself (he’s working on two novels right now on the iPad….). C and C: Do you read together a lot as a family? C and C: What is your idea of a perfect family day in Brooklyn? MI: A perfect day for us in Brooklyn is just hanging out together in the morning – Denis usually makes special pancakes or waffles, reading the paper, doing the NY Times crossword puzzle together. Then meeting up with friends, going on a outing to Brooklyn Bridge Park or taking the ferry to Governor’s Island (from the Brooklyn side! ), or riding our bikes by the water… We go shopping, and I make a dinner at home and we play games like “Pass Around” or “Botticelli” over dinner. We walk a mile to Boerhum Hill and get some Uncle Louie G’s Italian ice for dessert. I love this! I’m going to get it for my 3-year-old son who loves “monsters” (the nice kind, of course)! Thanks for sharing!